The Fall Crafters Fair has barely begun in Shipshewana when murder strikes the small town once again---this time on the property of Daisy's Quilt Shop. It will take all of the sleuthing skills Deborah Yoder and Callie Harper possess to catch the perpetrator. But the stakes are higher than ever before, since the material witness is their best friend's child. Everyone will have to go on a journey of faith deep into the heart of God's grace. 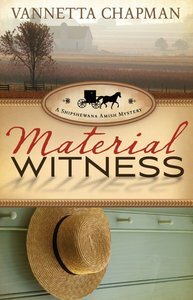 About "Material Witness (#03 in A Shipshewana Amish Mystery Series)"
Customer Reviews For "Material Witness (#03 in A Shipshewana Amish Mystery Series)"
When two women---one Amish, one English---each with different motives, join forces to organize a successful on-line quilt auction, neither expects nor wants a friendship. As different as night and day, Deborah and Callie are uneasy partners who simply want to make the best of a temporary situation. But a murder, a surprising prime suspect, a stubborn detective, and the town's reaction throw the two women together, and they form an unlikely alliance to solve a mystery and catch a killer. Set in the well-known Amish community of Shipshewana, Falling to Pieces will attract both devoted fans of Amish fiction and those who are captivated by the Amish way of life.